A 15-year-old girl was initially seen at an outside hospital for respiratory distress and diagnosed after a CT examination with extensive pulmonary emboli. After failed treatment with tissue plasminogen activator (tPA), she was transferred to Phoenix Children’s Hospital for a higher level of care. 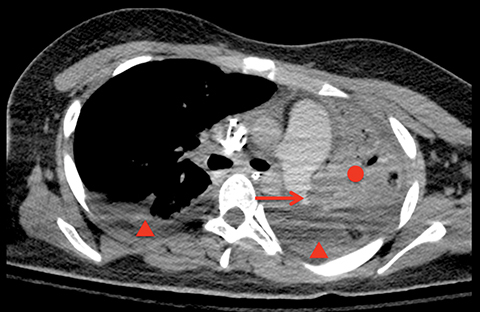 A repeat CT of the chest with contrast confirmed extensive pulmonary emboli (Figure 1). Left upper lobe consolidation and bilateral pleural effusions were also visualized. An ultrasound examination of the lower extremities to evaluate for an embolic source revealed occlusive thrombus within the inferior vena cava extending into the right common and external iliac veins (Figure 2). The patient was placed on ECMO but quickly experienced bleeding complications and expired. 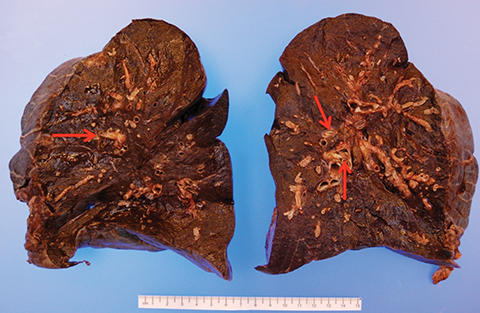 Autopsy revealed the pulmonary emboli to be tumor emboli, not bland thrombi, a finding that helped to explain tPA failure (Figures 3-6). 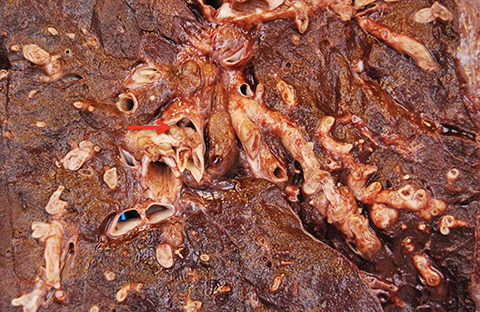 Postmortem CT images of the chest, abdomen, and pelvis (Figure 7) demonstrated an aggressive sclerotic lesion of the right iliac bone with periosteal reaction representing osteosarcoma. Associated ring and arc calcifications medially were consistent with the chondroblastic subtype. 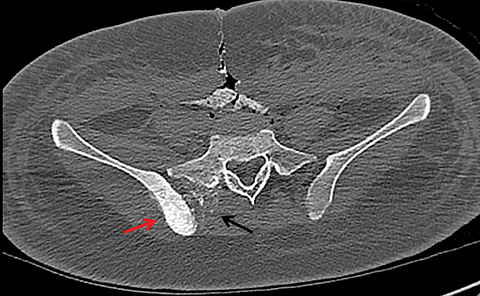 Osteosarcoma of the pelvis, including the chondroblastic subtype, is associated with worse overall survival compared to patients with extremity osteosarcoma. In a recent case series, Fuchs et al report an overall 5-year survival of 38%.2 In chondroblastic osteosarcomas, the chondroid component of the tumor may develop matrix visible on imaging, resulting in ring and arc calcifications. Patients with neoplasm have a four-fold increased risk of developing thrombus compared to the general population. Bland thrombus due to a hypercoagulable state is more common than direct tumor extension into vessels. However, differentiating between bland and tumor thrombus is important, as treatment is different. Inferior vena cava tumor involvement is seen with numerous malignancies affecting both the pediatric and adult populations. Many of these are retroperitoneal in origin, including Wilm’s tumor, renal cell carcinoma and testicular malignancies.3 The diagnosis of tumor thrombus is usually made during disease staging. The earliest case report is by Laurain et al in 1957, which described tumor thrombus retrospectively upon autopsy.4 During the 1970s, the development of venography techniques enabled diagnosis of venous thrombosis, but did not allow for distinction between bland thrombus and tumor thrombus. In the 1990s, ultrasonography, computed tomography, and magnetic resonance imaging became the preferred imaging modalities to evaluate tumor extent. CT and MRI can demonstrate enhancement of viable tumor thrombus. On Doppler color imaging, tumor thrombus can show intrinsic vascularity. Tumor thrombus in osteosarcoma remains a rare entity, but if suspected on clinical exam and routine imaging, further characterization with Doppler ultrasound, MRI and PET-CT is recommended. These imaging studies can distinguish tumor thrombus from bland vascular thrombus and evaluate the extent of vascular involvement.2 Differentiating bland from tumor thrombus is vital, as the treatment is different, and the latter may affect surgical options. Jani JC, Massad M, Kpodonu J, Alagiozian-Angelova V, and Guzman G. High-grade pelvic osteosarcoma with intravascular extension to the right side of the heart: A case report and review of the literature. Arch Path & Lab Med. 2005;129(2):241-243. Fuchs B, Hoekzema N, Larson D et al. Osteosarcoma of the pelvis outcome analysis of surgical treatment. Clin Orthop Relat Res. 2009; 467:510–518. Giuliano C, McCabe A, Haller J et al. Inferior vena cava – right atrial tumor thrombus in malignant pelvic bone tumors in children. Pediatr Radiol. 1992; 22:206–208. Laurain AR. 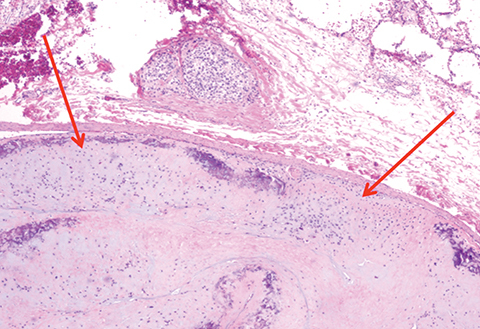 Intracranial tumor culture of osteogenic sarcoma with fatal tumor embolism; report of a case. Am J Clin Pathol. 1957 Jun; 27(6):664-671. Navalkele P, Jones S, Jones J et al. Osteosarcoma tumor thrombus: A case report with a review of the literature. Tex Heart Inst J. 2013; 40:75-78. Newkirk L, Vater Y, Oxorn D. Intraoperative TEE for the management of pulmonary tumour embolism during chondroblastic osteosarcoma resection. Can J Anaesth. 2003; 50:886-890. Hines N, Lantos G, Hochzstein J et al. 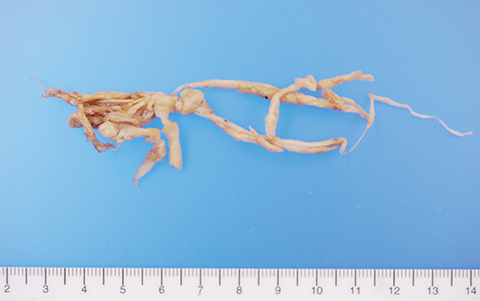 Osteosarcoma of the lumbosacral spine invading the central venous pathways, right-sided cardiac chambers, and pulmonary artery. Skeletal Radiol. 2007. 36:1091-1096. Epub 2007 Jul 6. Shurin S, Gauderer M, Dahms B et al. Fatal intraoperative pulmonary embolization of Wilm’s tumor. J Pediatr.1982; 101:559-562. Bolotin G, Dao TV, Vatsky S, Patel M, Dickman P, Jacobsen J, Jorgensen SA, Towbin AJ, Towbin R. Chondroblastic osteosarcoma with venous invasion and tumor emboli to the lungs. Appl Radiol. 2018;47(9):26-28. Prepared by Dr. Balotin and Dr. Vatsky while serving as Radiologists at Albany Medical Center, Albany, NY; Dr. Dao, Dr. Patel, Dr. Jorgensen, and Dr. Richard Towbin while serving as Radiologists at Phoenix Children’s Hospital, Phoenix, AZ; Dr. Dickman and Dr. Jacobsen while serving as Pathologists at Phoenix Children’s Hospital; and Dr. Alexander Towbin while serving as a Radiologist at Cincinnati Children’s Hospital, Cincinnati, OH.